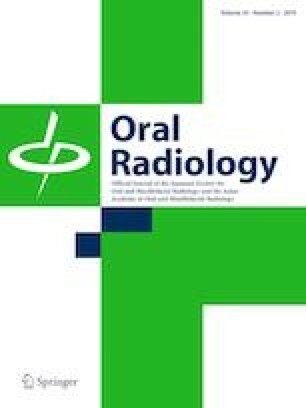 The aim of the study was to compare intraoral radiographs and CBCT images for detection of horizontal periodontal bone loss, and to investigate the diagnostic effect of different voxel resolutions in CBCT imaging. A total of 240 sites with horizontal bone loss were measured on the buccal, lingual, mesial, and distal surfaces of 60 posterior teeth in four maxillary and six mandibular bones obtained from cadavers (dry skulls). Direct measurements on the dry skulls were accepted as the gold standard values. Measurements on CBCT images at two different voxel resolutions (0.250 and 0.160 mm3) and intraoral bitewing radiographs were compared with one another and with the gold standard values. The measurements on the CBCT images at two voxel resolutions and bitewing radiographs did not differ significantly (p > 0.05) from the direct measurements on the dry skulls. No significant difference was found between the bitewing radiographs and CBCT images for measurements in the mesial and distal regions (p > 0.05). There was no significant difference between the measurements on the buccal and lingual surfaces at the two different voxel resolutions (p > 0.05). CBCT scans are recommended for evaluation of buccal and lingual bone loss to avoid intraoral radiographs that exceed routine examination of interproximal alveolar bone loss. Furthermore, instead of basing the voxel size on the required CBCT scans, it is recommended to select the smallest possible field of view to reduce the dose of radiation. Hayriye Cetmili, Melek Tassoker, and Sevgi Sener declare that they have no conflict of interest. The study protocol was approved by The Ethics Committee in Research of the Necmettin Erbakan University, Faculty of Dentistry (no. 2017/08). All procedures followed were in accordance with the ethical standards of the responsible committee on human experimentation (institutional and national) and with the Helsinki Declaration of 1964 and later versions.